Nice to see someone doing something different. gauthier484, thanks for your remark. I will give another name. Love, love, love this & all. This is awesome! The only problem I have is the color on the hand animation. I wish everything was black/ grey, that would rock! This is freakin artwork at is best! i love tis gear very much. 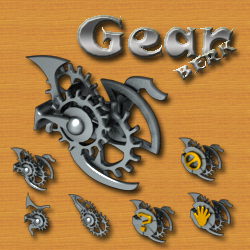 As a matter of fact, I DO like gears. I also like these cursors! Nice one!